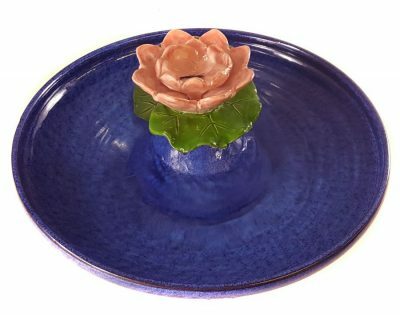 An absolutely beautiful cat fountain of high-fired stoneware and glazed in several gorgeous glazes. 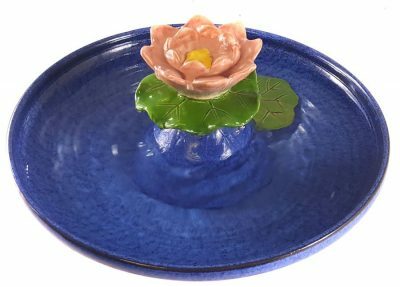 A waterlily sits atop a waterlily leaf, under-glazed in pale pink and dark green respectively. Water fills the flower, spills onto the leaf and trickles into the bowl, glazed in April Blue. 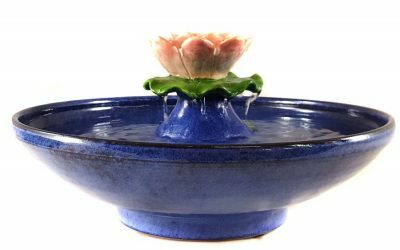 You can run this fountain with the ceramic insert which gives a more gentle display or leave it out for an upflow. Your cats can drink from the blossom, the trickles and the bowl. All completely handmade of highfire stoneware. * 3.75 inches high and 12 inches in diameter. Can be adapted for 0verseas use. Click here to select an overseas pump. All our cat fountains are handmade, one at a time, one of a kind of the highest quality stoneware. We make our own glazes from raw, pure minerals so we know exactly and how much of what is in them and can insure that they are food safe. Food safe is not simply a matter of containing no lead. If too much of a colorant is used or if any of several toxic colorants are used the piece will not be food safe. We restrict the percentage of only non-toxic colorants to standards established by scientist potters Ron Roy and John Hesslebirth. We guarantee our cat fountains to be completely food-safe. In addition they are extremely easy to clean, as many of the reviews testify to.